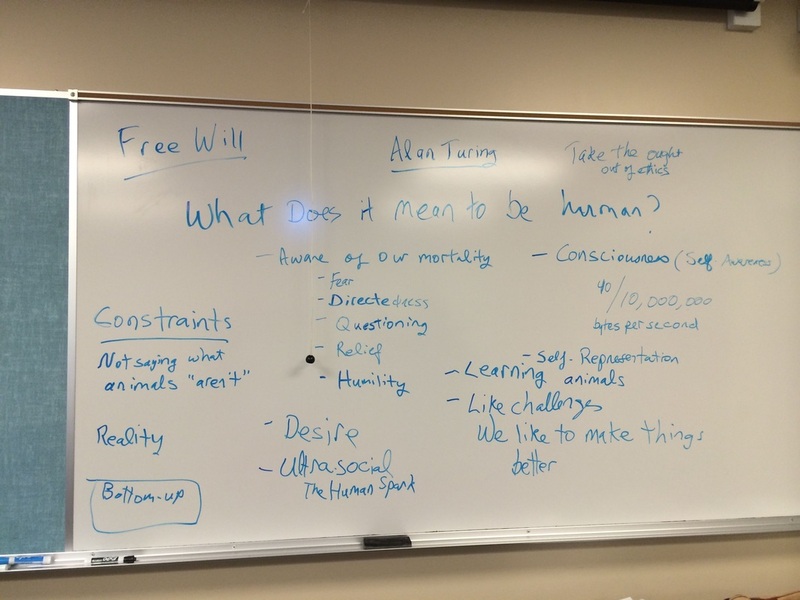 Last week we talked about what it means to be human. Our blackboard notes are below. The premise of the class is that we have free will, but that it is a subtle thing, and thus will benefit from our exploration and practice. It is subtle because so little of what our brain does is accessible to conscious awareness. Furthermore, the results of many studies indicate that many (if not most) of our decisions are reached by our brains' pre-conscious processes! How, then, can we be said to have free will? Here are two essays from the book Measuring the Immeasurable that we will discuss in class. In the first, The Science of Emotions and Consciousness, Dr. Candace Pert explains the interplay of attention with the various brain and body structures and processes. Please note that our brains are set up to register and remember based on chemical signals that we experience through opiate receptors. In other words, the physical substrate of emotions lines our neural passage ways. Pert has found that the density of opiate sensors increases exponentially in relation to proximity to the frontal cortex, which is thought to be the seat of our awareness. In the second article, Revealing the Wizard Behind the Curtain, Dr. Bruce Lipton discusses what William alluded to in our class on Wednesday, "the elephant that is running the show." Dr. Lipton describes these as the "programs" that we have picked up unconsciously along the way, and suggests how our mindful awareness can allow us to modify these sub-conscious programs. For more detail on the science of what is happening at the cellular and genetic level, I attach the referenced article by Fred Nijhout, a long-time Duke faculty member. DO NOT FEEL YOU NEED TO READ THE WHOLE ARTICLE. I highlighted the places that were quoted. Here are two chapters from Dr. Lipton's book, ﻿The Biology of Belief﻿. These chapter give a great description of how the cell works, together with lots of pictures. Unlike the Nijhout article, these chapters are written for those of us who have not studies biology for decades.